The simplicity of chestnut puree blends perfectly with a slice of lemon on a spoon. Details are the highlight of this subtle bar; the lip of a wine glass matches the silverware. This place could be nestled in the hills of San Francisco, celebrities knitted among the seated clientele. Only this is Omaha. This is The Grey Plume, already so well known it seems to have been a staple for years. Time passed and travels through Europe and West Africa were completed. In 2007, Chapman moved back to Omaha, acquiring experience at V. Mertz, Spencer’s, and teaching Chef Instruction at Metro Community College. The Grey Plume was then opened that December, giving Omaha a fresh way to experience luxury on a plate. Chapman and his staff not only offer delightful food; they also are the first Certified Green Restaurant in Nebraska by The Green Restaurant Association. When you visit The Grey Plume, you are guaranteed an experience that seems straight out of the West Coast. As a Green Leader for Omaha, Chapman and his staff will continue to raise the bar for other businesses throughout the metro. There is a place in Omaha that is a haven for farmer’s market addicts. Tomato Tomato is Omaha’s only year-round indoor farmer’s market, supporting nearly 30 vendors throughout the area. A young woman stood with her back to me, counting out bottles of olive oil with a vendor. This is Jody Fritz, co-owner of the store, friendly and outgoing, surely the result of her diet of local vegetables. What began on a white Costco table in a basement turned into a consignment successful enough to invite more vendors while ensuring the farmers were properly paid, an important part of having a sustainable business. Come visit this incredible local food gem, and cultivate one of the most important relationships you will every have, one with your food. “A green leader is like a good personal trainer; someone who has realistic expectations for how much they can improve, and then pushes to stretch those limits.” Kevin Flatowicz-Farmer balances his bike helmet on his knee, leaning on the handles of his bicycle. 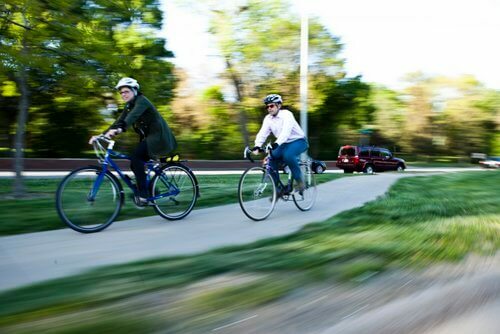 Known throughout the active transportation scene, Dr. Eikenberry and Farmer lead by example, commuting mainly with their bicycles and leading the grassroots organization Modeshift, an organization dedicated to making active transportation safe for all residents. This simple phrase would be perfect on many doors in Omaha, a reminder that being active is always the greener way to move about the city. With the work of ModeShift and the changes to the Transportation Master Plan, more residents may be closer to changing the way they move. Eric Williams: Program Coordinator, reEnergize Omaha. There is hardly a way to be more sustainable than supporting community gardens. These plots feed neighborhoods over the course of a season, providing produce to those who may not have access to nutritious food. I met Eric Williams beside the Dundee Community Garden, his pride evident as he beamed towards the budding grasses. An unwavering example of sustainable living, Williams will continue to inspire residents to change their lives for the better.